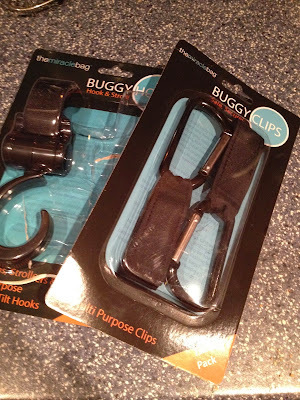 You might have read my review yesterday of the buggy hooks and clips from The Miracle Box which work very well with their Miracle bag changing bags. These clips and hooks are great for strapping on to your pushchairs handles, ready for carrying schools bags, shopping etc. The Miracle Box have very kindly allowed me to give away a pair of buggy hooks and a pair of buggy clips to one lucky reader. To be in with a chance of winning all you need to do is fill in the rafflecopter form below. This competition is open to UK residents only and will close at 11.59pm on the 5th December 2013. The clip on shopping bag. Love my buggy tug, especially in the snow! A buggy board is fantastic for a slow walking tot! Front wheel weights to stop it tipping up when you've got heavy bags on the back. I haven't used any accessories with my pushchair yet, but I have seen the hamster bag that I would like to get, I never have enough hands when pushing the buggy. Milton dummy sterilizer and teddy clip.